Teaching your kids to read. Thatâs the first major hurdle to complete in your homeschool, and the one that will make your head swirl when you look at all the curriculums to choose from. Some people spend hundreds of dollars on phonics programs and clever books to help them accomplish the goal. Being the thrifty soul that I am, I have to admit thatâs not me. Using homemade flash cards and easy reader books along with the book âTeach Your Child to read in 100 Easy Lessonsâ both my older boys were reading proficiently by age 5. Now I have the challenge to face with our 4 year old. Though he is not too thrilled with sitting still to begin the process of independent reading, I have learned to go with the flow, and use what works for his personality. So, when I saw at a used curriculum sale a set of Bob books for sale at a killer price I thought why not. Hey, if they donât work, theyâll go right back for sale on my table next year. He loved them. My older boys loved them as well. 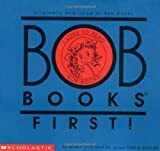 The Bob Books are very simple, short and sweet, and it took my little man only a few times of reading through the first few books to master the letter sounds introduced in level A. He looks forward to sitting down and reading them with his brothers, and then reading the books back all by himself while we all gather round and cheer and do silly dances for him as he successfully blends the sounds and forms the words correctly. The series has three levels, level A having 2 sets, 12 books in each set. Also, the books inspired my 9 year old to come up with âGarâ books. He created clever characters in funny situations to teach different letter sounds. He has used his own books to help his younger brother learn new letters and small words. Bob books are so simple theyâre brilliant, and are a great way to introduce your preschooler to reading. I donât think Iâll be putting them on my table this year at the used curriculum saleâ¦Iâll be keeping mine.